It’s time to take a look back at 2015. Glad that’s over. Moving on! Really, 2015 was not a great year for me. Maybe not even a good one. There were a few good points here and there, but most of it was overshadowed by, well, my working at a dayjob during the entire year for the first time. This left me with not much time for other things I wanted to do, none of which involved having a social life, so I still don’t understand how people have those. Now, I don’t think I’d actually have Slubes completed by now were I to have been furlough-vacationed like in 2014, but I’d be further in Darmenzi, more active around here, and have felt a lot more rested and ready to deal with the absolutely insane mandatory overtime of 6 days a week that lasted from mid-October to early December. Maybe 2015 wasn’t so bad, but literally everything those last few months did served to sour the entire rest of the year and make me want 2016 to get here already. Why do we do this to ourselves? Why do we make the end of the year one of will-shattering, brain-blasting stressful chaos? Do we just hate ourselves? Okay that was more than I’d planned to actually say on 2015, so let’s move on to 2016. Oh wait, I was going to mention Clichemas here since I never got that post made. Clichemas was figgin behind for pretty much everyone in my family I think? Certainly me and my mother. I got my shopping done with less than a week ago. My mom didn’t get everything wrapped in time. My aunt was like an hour late with the ham. I dunno. Anyway, in keeping with the tradition of Clichemas being a time of consumerism, here’s some stuff I got. 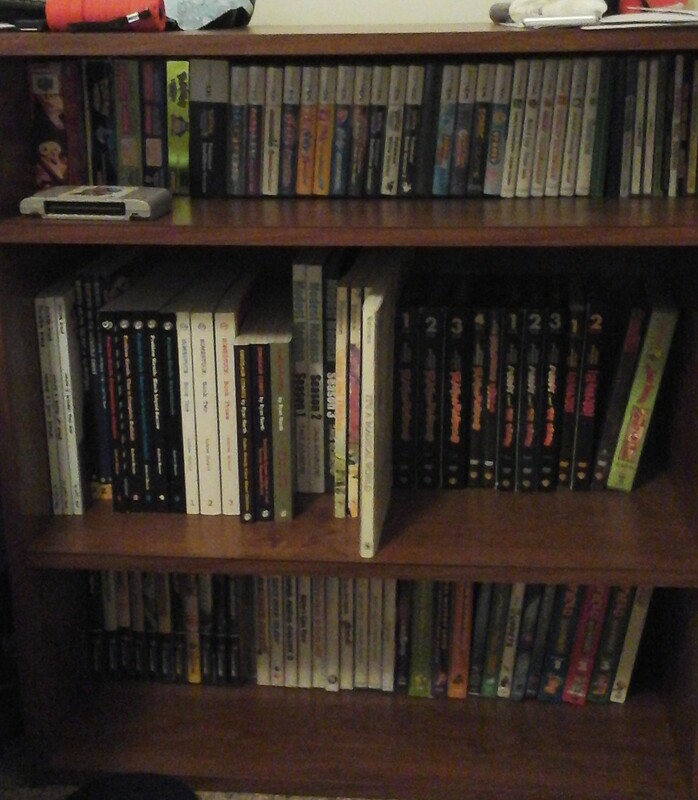 I got a new bookshelf, so I finally have room for all my books and can organize things a little better. More games there than books. The books are mostly on the old bookshelf still. 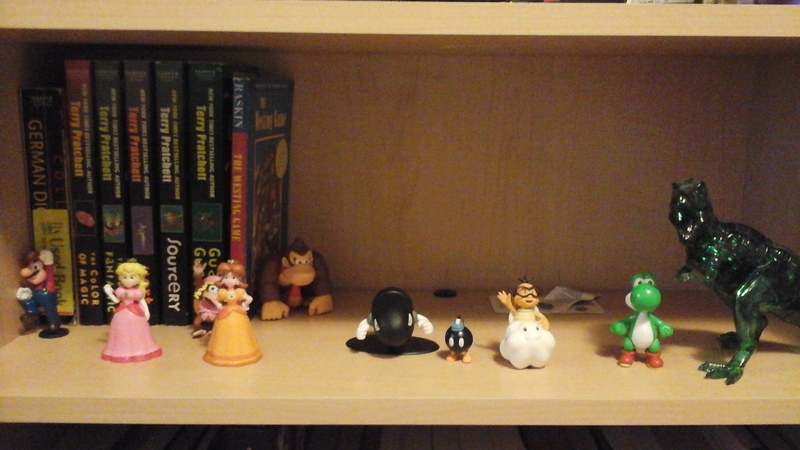 As for where the games and DVDs used to be, I got some figurines, too. Look! 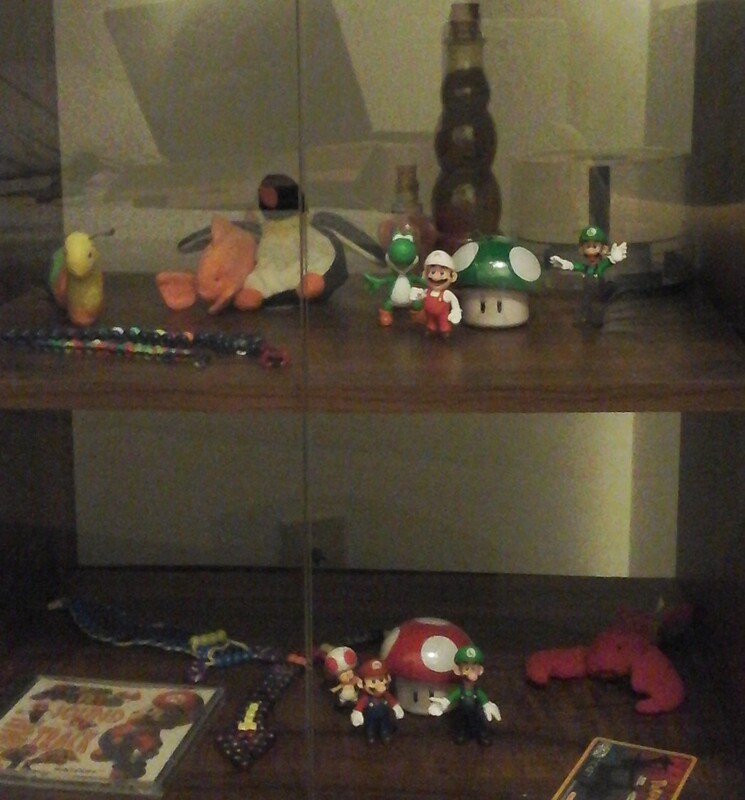 I also got a goomba, koopa, and shy guy, which are on my desk at work because they are the grunts and so am I. Also, notice that T-Rex 3D puzzle I showed here some months ago? I got a couple of those, too, so let’s get to reviewing ’em. First up is a puppy. Level 1, I brought this last Sunday to my work because we get almost no calls on Sunday and I had eight hours to kill. The puzzle took me one hour to finish. Wow, I’m too skilled for my own good. 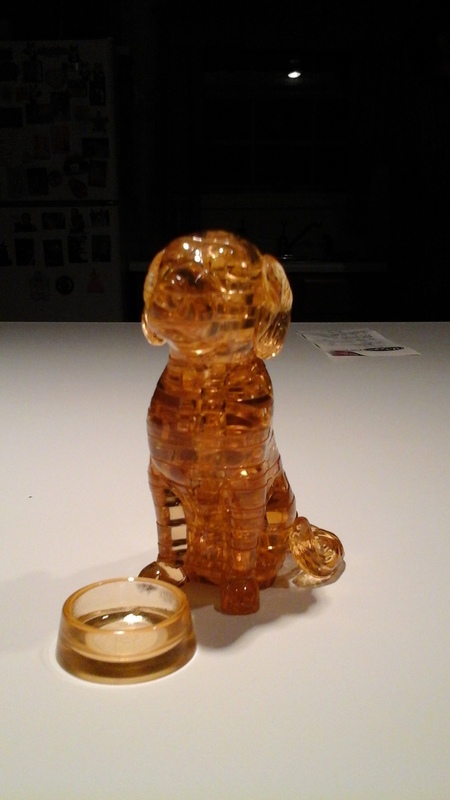 It also has an extra piece that I guess acts as a dog bowl. Anyway, it’s actually a bit loose at places, but I can’t tell if it’s supposed to be like that–the tail wobbles, but so do most dogs’, and its neck moves a little, but maybe that’s so you can position it. So I dunno. The other one is kind of amazing. Oh gourd, this was ridiculous. 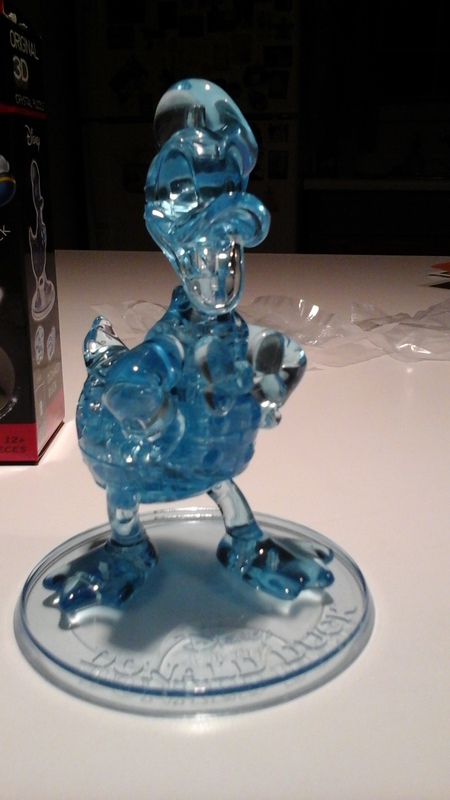 It’s Donald Duck. Finding the pieces wasn’t so bad, but keeping it together? It ranks below that butterfly I ranted over a while ago. The top part stays together, but there is no way to keep the bottom from falling apart if you tap it too hard. You can’t tighten it in any way I can see. There’s a pole, but it doesn’t actually make it tight. I’m not even sure if I’m doing it correctly, but here’s the truly amazing part: They have a website where you can look up instructions on these puzzles. Most of the time they have a picture of the piece with an identifying number and the order you should put it in, so one could see which pole to put in and when. Not so the Disney ones–they have a number and the order. No picture. So each piece has a number and you have no idea which piece each number corresponds to. Anyway, I took a picture before it was tapped too hard and fell apart. It’s now in pieces in the box. Well, that was my Clichemas. Tomorrow chapter 10 will be put up. 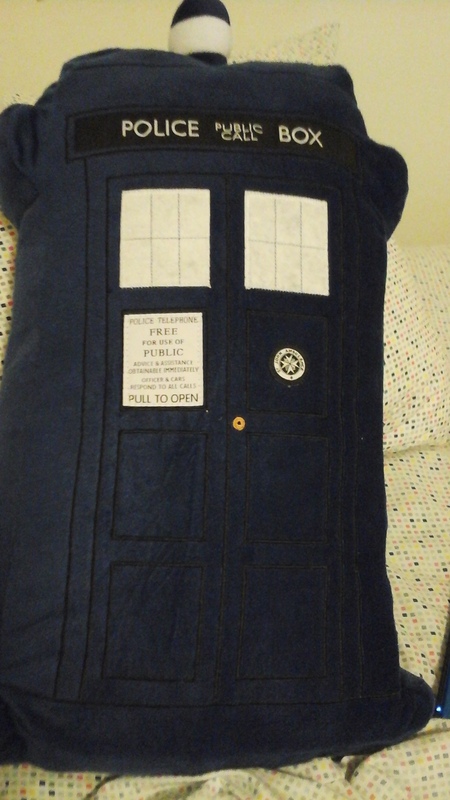 Oh, and I got a TARDIS decorative cushion.